Walter B. Gibson was already quite an accomplished fellow when in December 1930 he accepted the freelance writing assignment that assured his prominent place in American popular culture. Born on September 12, 1897 in Germantown, Pennsylvania, Gibson worked as a newspaper reporter, non-fiction ghostwriter, and composer of crossword puzzles. His main interest was magic, and in addition to practicing the art of prestidigitation himself (during the late Twenties he served as president of the Society of American Magicians’ Philadelphia chapter) Walter ghosted books for famous illusionist Howard Thurston and Harry Houdini, posthumously in the latter case. He also edited the short-lived magazines Tales of Magic and Mystery (1927) and True Strange Stories (1929). With the Great Depression in full swing, the indefatigable Gibson hoped to supplement his income by writing mystery novels, currently enjoying unprecedented popularity in America. Walter believed that his background and experiences, coupled with his love of magic and trickery, would enable him to craft complex puzzle plots guaranteed to stump all but the most perspicacious armchair sleuths. 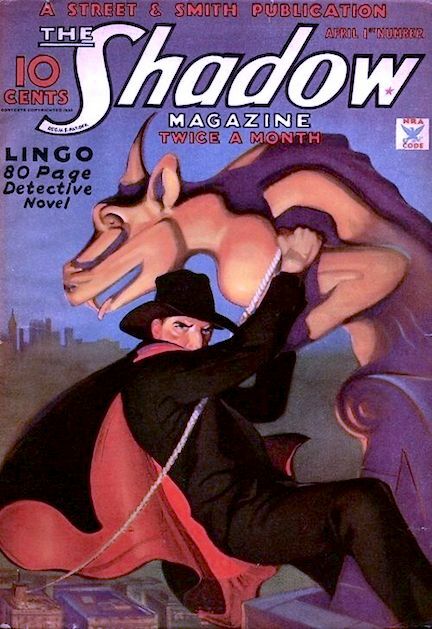 As fans of The Shadow already know, the character had been created as a narrator of mystery stories written for Street & Smith’s Detective Story Magazine and dramatized on the Detective Story Hour, a 30-minute radio program that premiered on July 31, 1930 and was broadcast every Thursday evening. Writer Harry Charlot came up with The Shadow, whose sepulchral tones and sinister chuckles elicited shudders from listeners. Although the series was intended to promote Detective Story Magazine, Street & Smith responded with alacrity when followers of the radio program besieged their local newsstands demanding copies of “that ‘Shadow’ magazine.” The firm’s general manager, Henry W. Ralston—whose S&S experience dated back to the dime-novel days—saw an opportunity to revive the single-character magazine while capitalizing on the public’s burgeoning interest in The Shadow. He ordered editorial director Frank Blackwell to produce a Shadow pulp, and Blackwell delegated that responsibility to editor Lon Murray, who knew Gibson and recommended him to Blackwell. According to some sources, Ralston would have been happy with a rewritten Nick Carter novel, but the magician-journalist from Pennsylvania—who would use the pen name “Maxwell Grant”—had other ideas. Walter Gibson didn’t just flesh out the character created by Harry Charlot as nothing more than a menacing voice; he created a saga with recurring themes, characters, and locations. His Shadow was—at least initially—a man of mystery, an enigmatic crime fighter who by the light of day masqueraded as several people, most frequently a globe-trotting millionaire named Lamont Cranston. The Shadow’s own identity and background remained deep in the series’ background, although here and there Gibson dropped tantalizing clues about the character’s past. A legendary figure feared by New York’s underworld, the Master of Darkness (as Walter soon nicknamed him) employed a network of agents and seemed to have near-limitless resources with which to wage his never-ending war against criminals. To New York police commissioner Ralph Weston and most of the NYPD he was a figment of the imagination, but Inspector Joe Cardona knew The Shadow to be real. This 1933 cover is a fan favorite. The magazine’s popularity was such that in 1932 Walter Gibson was informed that henceforth it would be published semi-monthly, requiring him to write 24 novels of approximately 60,000 words each in a 12-month period. By now deeply committed to the series and enjoying his work, Gibson signed his first yearly contract. He completed those 24 novels—some 1,440,000 words, all told—in less than ten months. And on a manual typewriter to boot, pounding the keys so hard and fast that his fingers sometimes bled. The punishing schedule forced Gibson to modify his working methods, especially after he crowded one story with unnecessary characters and a dizzying succession of incidents that rendered the yarn nearly impossible to follow. In order to ensure the maintenance of a high level of quality, editor John Nanovic (who had taken over from Lon Murray) and Gibson met regularly with Henry Ralston to chart The Shadow’s future. Walter prepared plot outlines that the three men discussed in detail, and he incorporated changes as necessary before proceeding with the actual writing. In this manner he avoided the hang-ups that typically bedeviled fast-writing pulpateers working on tight deadlines. Gibson found that he could bang out a 60,000-word novel in eight days, producing roughly 30 pages per eight-hour day. The mysterioso atmosphere of the early Shadow novels gradually dissipated as reader demands for constant action increased. Ever the magician, Walter found myriad ways in which to introduce gimmicks based on magic tricks, and he relied heavily on misdirection to lead readers astray. By early 1934 the series had hit its stride, creatively speaking. But the proliferation of imitators began to eat away at the magazine’s circulation, which at its peak surpassed 300,000 copies per issue. The Shadow Magazine changed course in mid-1937 when Gibson in a yarn titled “The Shadow Unmasks” finally revealed the Master of Darkness to be Kent Allard, a World War I ace and world explorer thought to have been lost in the Guatemalan jungle after a plane crash. The Shadow was forced to assume his real identity when plot complications made it temporarily impossible for him to continue his masquerade as Lamont Cranston. Thereafter Allard appeared at regular intervals, even though the Shadow radio show (which by now revolved around the Master of Darkness) left no doubt that Cranston and The Shadow were one and the same. The series began to falter in the late Thirties. By 1941 it had become stale and, even worse, puerile. The previous year Street & Smith had launched Shadow Comics, which exposed the character to a larger but younger audience. 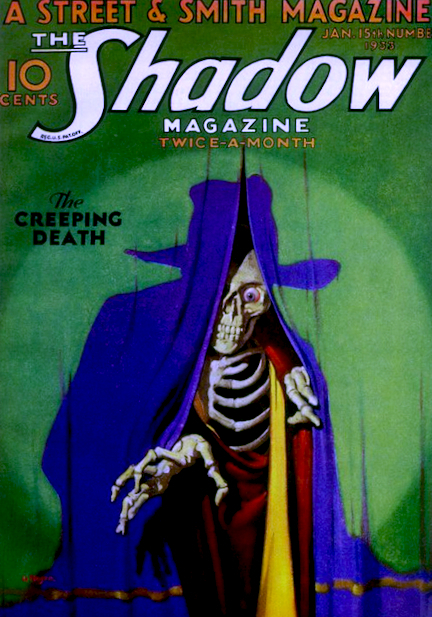 Gibson began scripting the four-color stories as well as the pulp novels, and whether by author accident or editorial design The Shadow Magazine gradually lost its appeal to older readers. In 1943 the magazine shrank to digest size as a concession to wartime paper rationing and Gibson was instructed to cut back on the master villains and other remnants of the lurid pulp era. The digest Shadow novels, averaging 30,000 words, played up Margo Lane (a product of the radio show incorporated into the pulp series with mixed results) and with few exceptions sported routine whodunit plots. John Nanovic had left Street & Smith and his Shadow Magazine chores were assumed by Charles Moran, William de Grouchy, and Babette Rosmond; during the latter’s tenure as editor the magazine’s title was changed to Shadow Mystery. Increasingly unhappy, Gibson was frozen out in 1946 following a salary dispute. At Rosmond’s suggestion his successor, Bruce Elliott, eliminated The Shadow altogether and made Lamont Cranston a medium-boiled detective. Walter continued writing for the comics, penned true-crime stories, and even tried his hand at science fiction during the Fifties. He never stopped trying to revive The Shadow, and in 1963 he wrote an up-to-date adventure of the Master of Darkness, published by Belmont as a mass-market paperback titled Return of The Shadow. Sporadic reprint volumes and revivals of the radio show kept the character alive, and today The Shadow still enjoys considerable popularity. Walter B. Gibson lived long enough to see new generations discover The Shadow in one form or another, and he cheerfully regaled young and old fans with stories about the halcyon days of pulp publishing at various conventions before his death in 1985 at the age of 88. I got into pulp collecting with the goal of compiling a set of The Shadow Magazine, which under several title variants ran to 325 issues. I acquired approximately 220 issues before abandoning the project, having read too many stinkers. The character no longer holds for me the appeal he once did, nor does the prose of Walter B. Gibson. But his was nonetheless a towering achievement in the world of pulp fiction, and it’s entirely fitting that we acknowledge and celebrate his 118th birthday. My favorite issue: Great cover, great novel. Really excellent summary, Ed. The Shadow has always been one of my favorite characters, I’m really enjoying the novels reprinted by Sanctum Books. I’d like to know why you don’t enjoy them as much as you used to. Thanks Ed. Enjoyed the tribute to one of my favorite characters. A belated thanks, Ed. Great tribute and overview of Gibson and his life with THE SHADOW magazine!